While Cat Tales is usually at capacity and cannot take in owner-surrendered cats, we would certainly like to help all cats find nurturing homes where they can live out their lives. 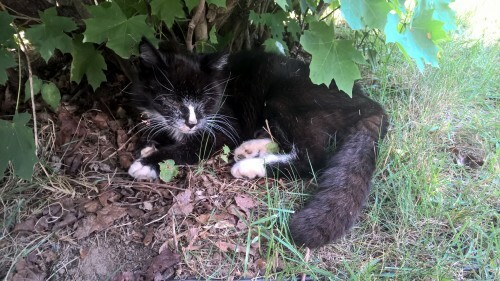 Due to the significant increase in the number of homeless animals in the last several years, Cat Tales has decided to meet a community need by dedicating a page on our site to list cats not fostered by us, but still in need of placement. There are many, varied reasons why these cats cannot be kept by their current families. And as much as we would like to place all of the cats currently in our charge, we realize that sometimes placement from one home to another can also be a good solution to the overall problem of pet homelessness. With that in mind, we urge you to consider all your alternatives before deciding to add to the pool of hundreds if not thousands of homeless animals in our state. Please be aware that finding homes for cats is a time-consuming project. Adoption rarely occurs quickly. It can take several months or longer for any cat to be re-homed. Should you want a list of helpful questions to ask prospective adopters, one can be e-mailed to you. In order to effectively post your cat, we will need specific information about the cat. Please contact us and we’ll send you the list of requirements so we can post a profile to our site. Note Cat Tales is not responsible for any part of the transaction between the current family and the prospective adopting family. Ryder & Dexter are a bonded pair in need of a temporary foster home due to unexpected move. Ryder (orange tabby) is a big love bug - loves people and cuddling! 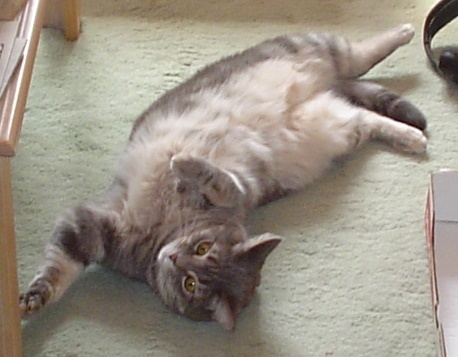 Dexter (gray tabby) is playful and outgoing. They are very tolerant of dogs but have never been around young children. Both cats are 3-4 years old, neutered and indoor-only cats. 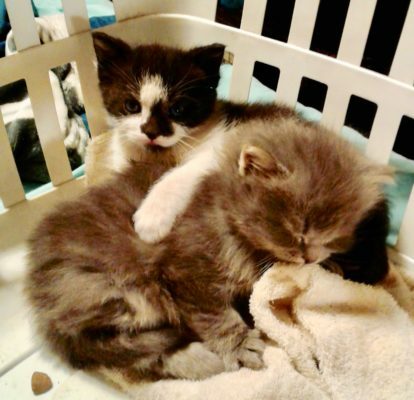 We will pay for vet treatment they may require during the foster care as well as litter and food. It may be until the spring when we can take them back. 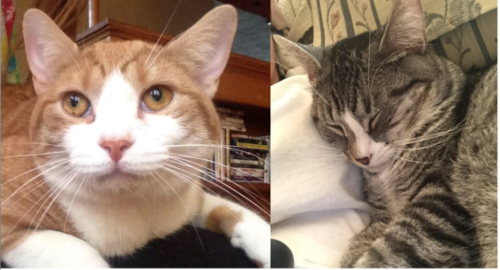 We love both cats dearly, we rescued both and hope to be able to have them again as soon as possible. Please contact Sarah at (860) 681-7430 or by email gerrishsarah014@gmail.com as soon as possible if you can assist. Hi my name is Sawyer. I was a stray and now looking for a forever home. Currently I'm being fostered and taken care of. I'm a little scared and confused from living on the streets, but when I get to know you I'll show affection. I don't mind being picked up and like to be pet. I'm neutered, received all vaccinations. If you are interested in Sawyer please email info@cattalesct.org. Two (2) small kittens for adoption. We found them abandoned in our garage. The first kitten is female white and black. She is rambunctious and loves to play, is cuddly and affectionate. The second kitten is also female and all gray and has longer fluffier hair and she does like to cuddle once you start petting her. They are currently not vetted as we just found them. Looking for someone to adopt the pair and vet them. Thank you very much for helping us find these precious little girls good homes. Please contact Kristen Cahill at 860-921-2651 or Richard Potter at 860-890-5304. Hi my name is Mr Whiskers I'm about 2-3 years old. I'm very friendly n very loveable. And I am homeless. Please help me. I'm a good boy who needs a family to love me n keep me forever. My friends name is delight Watrous you can reach her at 860-262-4179 or email dede869.dw@gmail.com. Please help.